As a food lover, I absolutely adore cookbooks. I have a ton of them – all filled with pages and pages of delicious recipes for me to try and experiment with. Perhaps some of you do as well. My favorite part of a cookbook is the visuals – mouth-watering pictures of food heaven on perfectly arranged plates. It’s enough to send even the casual eater into foodie nirvana. Most cookbooks I own have wide margins and extra pages in the back to make notes on. Because I’m a total cooking geek, I take full advantage of this feature, making notes of things I’ve tried, adjustments I’ve made to the measurements, different methods of arranging the dish, et cetera. Sometimes I’ll even print out photos I’ve taken of my dinner table to have as a reference. My favorite method of recording information, though, is sketching. If there’s a complex dessert I have to make that requires a careful assembly, there’s no better way to figure it out than by drawing it. Making a sketch in my recipe allows me to keep a visual record in addition to a written one, so that I can produce an even better outcome next time. In this way, my cookbooks are almost like sketchbooks, and that’s exactly what I’m going to talk about today. Image Source: Characters by Loggia. In my opinion, and I’m definitely not alone, designers don’t keep sketchbooks nearly often enough. 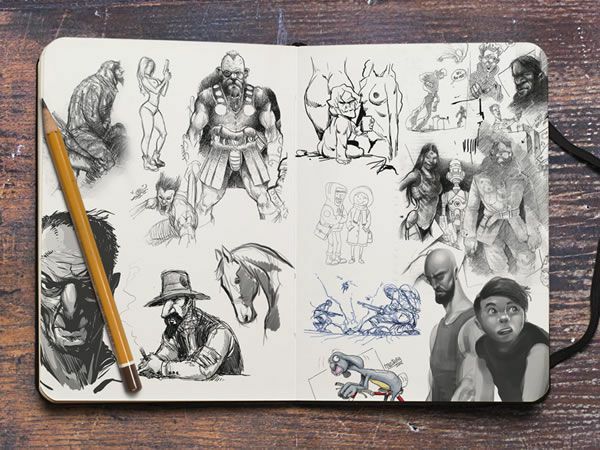 A sketchbook is possibly the best way to keep track of your ideas and to document your thought process, but many designers – even those who went to school – are afraid of “ruining” a new sketchbook with their “bad” drawings. This is a silly notion that needs to go away forever. Sketching in a design context is not – I repeat: not – about how well you can draw. It’s a tool to develop your brain. By sketching regularly, you can actually improve your ability to think critically and quickly call up creative solutions whenever you need them. The earliest cookbooks were simply records of what wealthy, upper-class people ate. They were created not for the wealthy themselves, but for their kitchen staff. Modern recipe books used by chefs serve much the same purpose. They serve as a working guide to help cooks solve their diners’ main problem: they’re hungry and they want a delicious meal. Image Source: Sketchbook by Mustafa Kural. In this same way, a sketchbook is a visual reference for solving problems. Most cooks I know don’t follow the recipe exactly, and you don’t have to use everything you put down in your sketchbook. It’s simply a reference for you to use – just like a mood board, a wireframe, or a comp or draft. The days of the “secret recipe” are over. Recently, there’s been an explosion of celebrity chefs who have released their own cookbooks full of recipes developed on their television shows or in their restaurants. Scores of non-celebrity chefs and professional food bloggers are also eager to share what they know. In fact, even people who aren’t chefs, such as Gwenyth Paltrow or Martha Stewart, put out recipe books. Why? Because helping others improves your image. Sharing what you know can put you in a position of authority, even if you’re not a so-called “expert.” It helps you stand out as someone who is looking to provide value and help people help themselves. 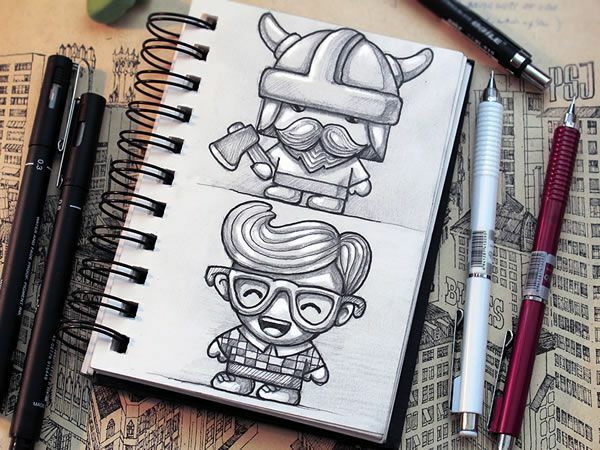 Image Source: Sketchbook by Graphicsoulz. Look, I know how many designers feel about their drawing abilities. But as someone who’s hired designers in the past, I can’t tell you how awesome it is to find one who’s willing to share their sketches and expose the inner workings of their brains. Clients love to see your thought process. It makes them more likely to want to do business with you, rather than the next person. Your sketches don’t have to be beautiful, and okay – you don’t have to share the ones that look like a kindergarten class had a riot across the page. But sketches that show the way you think are immensely valuable to clients. It helps them see how you will apply your brain to their own projects. If all you ever share on your website are the polished, finished products in their annoyingly perfect glory, you’re missing out on connecting with people on a personal and intellectual level. Showing nothing but the finished product is dry and boring, and it doesn’t solve your clients’ problems. Your client isn’t paying you for work you did for someone else. They’re paying for the way you approach your designs – the way you think. Cookbooks often have a theme – desserts, vegetarian, etc. There are also single-subject cookbooks, dealing with things like pizza, pasta, bread, or any other singular dish. Then there are cookbooks that can instruct you on certain cooking techniques like baking, barbecuing, or cloning recipes for popular commercial foods you would find in a restaurant or grocery store. It’s not necessary to include every single bit of information related to cooking in every cookbook. No one would ever need or want to buy more than one of them, for one thing. Also, a cookbook that comprehensive, if it existed, would probably be the size of your car. 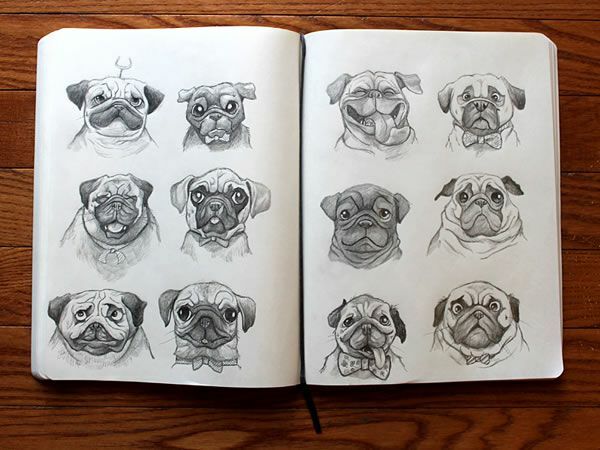 Image Source: Pugs by Dave Mottram. When sketching and sharing your design “recipes,” it’s a tremendous benefit to pare down the theme of your sketches to whatever is relevant to your project. If you’re coming up with new ways to incorporate animated type in your mobile interface, it’s not really that enlightening if you have a pencil drawing of your dog randomly dropped in. You don’t need to show every single sketch you do, nor does every sketch have to be inherently useful on its own. Rather, it’s the overall process of keeping records that’s important. If you do start keeping a regular sketchbook, it’s easy to get overwhelmed by the volume of sketches you’ll produce. As a formally trained illustrator, I’ve been keeping sketchbooks for many, many years. I don’t actually throw anything out, but I do have to occasionally put boxes of papers in deep storage because there’s just no room for them in my house. My reference and inspiration folders are the same way. It’s important to constantly update your resources; if something is no longer useful, get rid of it. Clutter on your hard drive leads to clutter in your work. Do you keep a regular sketchbook or journal? How does it aid you in the design process? Do you think you could benefit from showing your sketches to others?